Jeff Gundlach on Monday spoke with CNBC’s Sara Eisen, and among the topics Gundlach discussed was his call on US Treasury bonds. “Treasuries are still slightly cheap,” Gundlach told Eisen, despite 10-year and 30-year bond yields having fallen significantly during 2014. At the beginning of the year, the consensus call on Wall Street was that bond yields would rise — not fall. But after the 10-year yield started the year at 3%, yields have steadily fallen, going as low as 1.86% during the wild morning of October 15 that marked the stock market’s most recent bottom. Gundlach reiterated his view to Eisen that 2.2% remains a “line in the sand” for the 10-year yield, and said that discounting that wild morning of October 15, that level has just about held this year. On Monday, the 10-year yield was about 2.32%. Gundlach singled out the value of Treasuries against corporate and municipal bonds in particular. And while Gundlach’s call that Treasury yields would fall during 2014 has been right, what is even more remarkable to Gundlach is how Treasuries got there. Bloomberg.comOutside of the wild swing lower in October, 10-Year Treasury yields have had a fairly orderly decline in 2014. Back in 2012, the 10-year yield fell from about 3.75% to 1.75%, but Gundlach said that decline saw brief periods where yields rallied sharply, rising as much as 0.8% or 0.9% quickly, before going lower again. 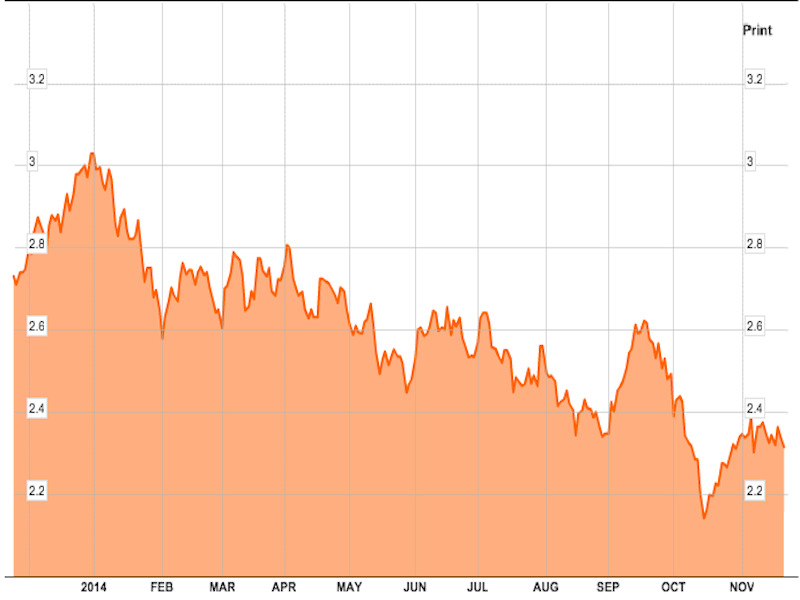 In 2014, by contrast, yields have been steadily grinding lower will almost no pauses. And while Gundlach didn’t give a specific forecast for Treasury yields in 2015, he said that rates won’t go up because they can’t. Citing the declining price of commodities and oil, Gundlach said it’s likely that inflation in the US may well be 0% year-over-year next year. The Fed’s current inflation target is 2% year-over-year. 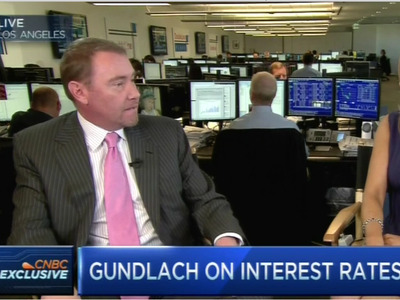 “I think the Fed might raise rates just to see what happens,” Gundlach said. “The Fed doesn’t want to raise rates, but they don’t want to be at 0. They’re in a bit of a conundrum,” Gundlach said. Back in his September webcast, Gundlach said that Janet Yellen and the Fed have no interest in raising rates, citing both the lack of inflation and the lack of wage growth. And while there have been a few signs of improving wage gains and a tightening labour market, inflation is still nowhere to be found.